With our interests in history and historic buildings, we throughly enjoyed visiting the old mining town of Virginia City. I remember our family (back in the day) watching Bonanza, an old western show that was centered around Virginia City. There remains an old saloon by the name of Bonanza in town, (I was hoping Hoss, Little Joe and the others would come riding into town, but it didn't happen.) Aside from the TV series, there is so much history here from the mining days. The Gold Canyon area had many operating gold and silver mines and several little towns, the largest and most prosperous being Virginia City. This is a very picturesque town with old west saloons, many of the buildings and interiors being original, boardwalks and 19th century victorian era houses, all very awesome. 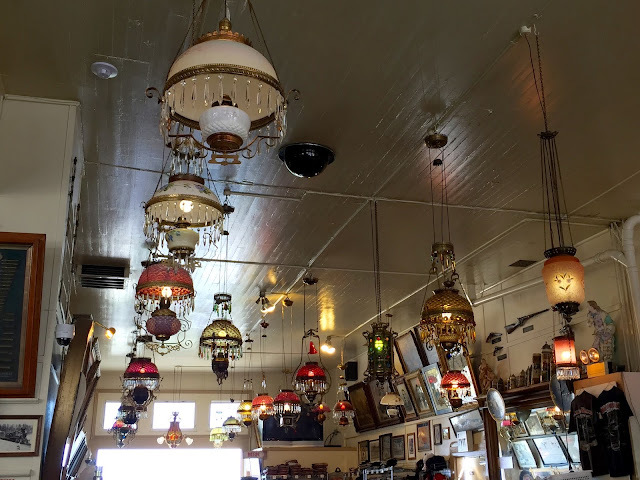 I loved all the old colorful lights hanging from the ceiling inside this western saloon. 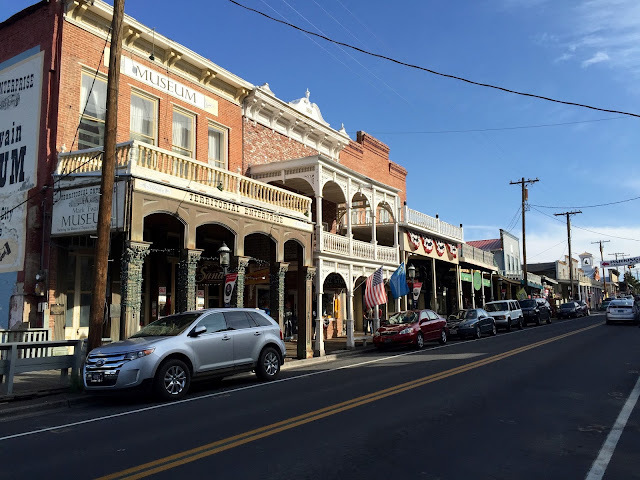 Main Street Virginia City - "The Comstock Lode, as the wide spread gold and silver bonanza was called, turned Virginia City into the first truly industrial city in the West in the years following the 1857 discovery; the population soared from 4,000 in 1862 to 25,000 in 1874. $500 million (billions in today’s economy) attracted all kinds, mostly males, Europeans, and Chinese." An interesting side note, Samuel Clemens worked for the newspaper in town and this is where he first took on the pen name of Mark Twain. The museum in the left was the newspaper office where he worked. In the hills around Va City we saw several bands of wild horses. Some in the distance and others eating grass by the side of the road. There are road signs posted to watch for wild horses just like the deer warning signs we had back home. We continue to work our way north, heading for the Columbia River in Oregon.